"Heaven, I'm in heaven, and my heart beats so that I can hardly speak"- these lyrics from the Frank Sinatra classic Cheek to Cheek always come to mind when I discover something that at first bite melts my insides and takes my breath away. What can I say, I'm a lover of fine foods and I get a thrill from new and exciting discoveries such as the luxury brownies of Dello Mano. Since its inception in 2006 Dello Mano (loosely translates as 'of the hand') has slowly but surely acquired a deserved reputation that reflects a commitment to uncompromising quality, and a dedication to creating the best brownies possible; an endeavour I believe they've succeeded in. This small family run business is the love child of Deborah Peralta, a former food scientist and marketer who previously worked with multinational companies such as Cadbury and Arnotts. Deborah's professional background, combined with her passion for fine foods and creative genius led to the development of her own brownie recipes, and ultimately a business venture that was destined for success. The luxury brownies are handmade with love, Belgian chocolate, farm fresh free range eggs, Australian butter and other locally sourced ingredients. They come in a range of tempting varieties including the Classic Belgian Chocolate, Espresso Walnut, Honey Caramelised Macadamia, Coconut & Lime and my personal favourite, Peanut Butter; although slow to catch on in Australia, the combination of chocolate and peanut butter is one of the few American customs I'm happy to adopt! The brownies come as a cube ($4.00) or bar ($5.50), which may seem expensive but in this case you get what you pay for - the combination of love, passion, quality and locally sourced ingredients result in an exceptional product. 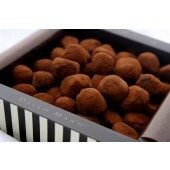 They can also be purchased in gift boxes from a single brownie up to the signature 16 piece; as can their Belgian Chocolate Truffles which come in Classic, Madisson Mint and Strawberry varieties. Gluten free options offered are Belgian Chocolate Truffles, Classic Belgian Chocolate Luxury Brownie and the Belgian Chocolate and Roast Hazelnute Spread which sounds delish. Other handmade delicacies on offer include Dark Chocolate Granola, Fig & Almond Muesli, creamy fudge, and cookies such as Traditional Ginger, Caramelised Oat & Coconut, and Orange Sugar. The cookies can be purchased individually ($3.00) or in a pack of 5 ($12.00). Most products can also be purchased online via the website and delivered, including luxury gift hampers and products by occasion. 7 months ago after a 6 year stint at Newstead, Dello Mano opened its big red doors at 29 Doggett St, Teneriffe and has quickly garnered the support of the local community. What was initially intended as a brownie shop that serves coffee, morphed into a funky cafe where retro meets contemporary. Deborah and her husband Bien have used warm, earthy colours to create a gorgeous, ambient space complete with a homely book-nook, fabulous seventies chandeliers and alfresco seating. They now serve an all day basic breakfast and offer a small selection of savoury snacks including a French Vegetable Tartlet (pastry made from scratch - $6.00), filled foccacias and an inventive Bacon and Egg Muffin ($7.00). A range of beverages will whet your whistle and new to Bello Mano is a range of Byron Bay teas which includes the inimitable Buddha's Tears. I found the service to be fast, friendly and accommodating. I had a Chai Latte on soy ($4.00) which despite its weak appearance, had an unexpected full bodied flavour, alongside a Classic Belgian Chocolate Brownie ($5.50). The brownies aren't at all what you might expect a brownie to be - they don't have a crumbly cake or biscuit style texture, in fact besides a light, delicious chocolate crust on top, the remainder of the brownie is crumb free, with a soft, moist almost fudge-like consistency. It was amazing and my mere words cannot begin to do it justice. 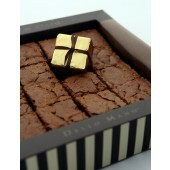 I adhere to the everything in moderation motto, so when I do treat myself I try and make it worthwhile with quality products - these luxury brownies are the kind of superior treat that I can devour without guilt, rest assured that they were calories well spent! Thanks for letting us other chocoholics know about Dello Mano. It sounds delish! I don't venture into the city very often, but I'll definitely make an effort to go here. We went to try out the Brownies and Coffee and found the staff to be very helpful and friendly. Good Coffee the barista knows how to make a strong coffee without burning it. My two year old daughter and missz gave the thumbs up to the brownies. It was worth the visit.